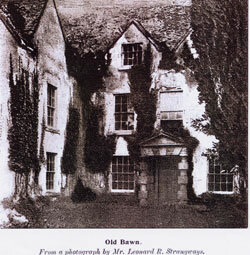 Close to the Old Bawn road and the Dodder was situated one of the most important houses of the Dodder Valley – Old Bawn House. Archdeacon William Bulkeley, son of Archbishop of Dublin, built the house in the year 1635. During the rebellion of 1641 the house was damaged, but was restored soon after. The house continued to be lived in for many years, but was eventually demolished. There was a local tradition in the old neighbourhood of Old Bawn House, that each year on the anniversary of the death of Archdeacon Bulkeley, a coach drawn by six headless horses and containing two passengers attended by two footmen, drives up to the house. However, woe betides anyone who looks on the coach, for they will die within a year and a day………..or so the story goes.